Once again, my posts were deleted off my phone somehow. I am not sure why sometimes this randomly happens. I am very excited to return home and get a new phone and grateful that Andrew also blogs so that when my posts are deleted, we still have an account of the day. I enjoyed staying with Chris in Blantyre very much, as my long posts portrayed… Before they were deleted. I am going to try to recover them so wish me luck. Anyways, today we arrived in Harare, Zimbabwe around 9am and Dean, Rachel’s husband was there to pick us up. 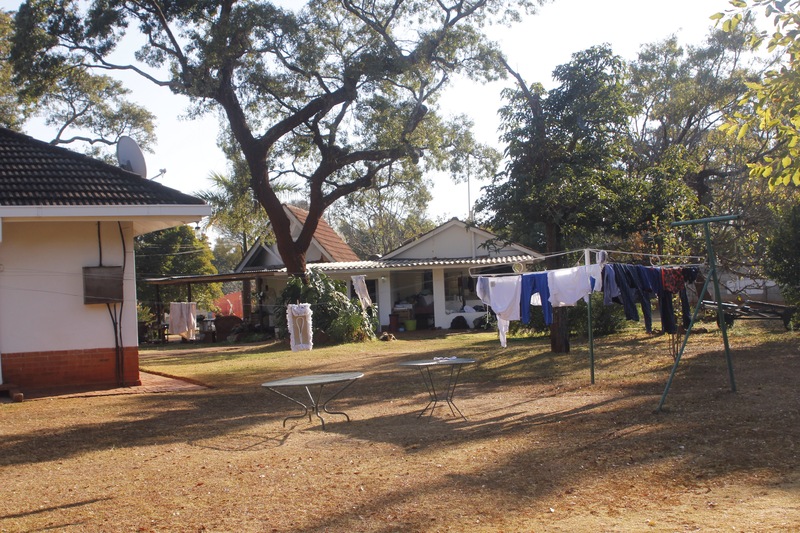 He drove us to their beautiful home in the heart of Harare and although it was late, Rachel and Dean sat down with us to chat for a few minutes before bed. Rachel is one of the founders for Eyes for Zimbabwe, an organization that focuses on providing health care such as cataract and cleft palate surgery for people in the “bush.” Eyes for Zimbabwe is a local organization so they are able to access people and places that no one else can access. They work in the border areas near Mozambique, Zambia, and Zimbabwe where not many organizations have the capacity to go. When they drive into the bus they fill their trucks with supplies that they can give to the poor. Rachel emphasized the point that you can’t fix the eyes or teeth of someone who is starving. Zimbabwe (as well as the rest of Southern Africa) is just entering the hungry season. Just before we left Malawi, the government announced that it’s corn reserves were completely depleted. They said that the corn silos had developed leaks and most of the corn had rotted, which in actually means that the Malawian government decided to sell all the corn to a neighboring country (probably Tanzania) and pocket the money. In Zimbabwe the government is just as corrupt, if not even more corrupt. Zimbabwe is in the hungry season (August to February) and you can see the disparity in people’s eyes. People stand on the street corners selling the single items they can get their hands on. Some sell a pair of shoes, some sell little bags of peanuts or popcorn, while others sell newspapers or used books. Just recently the government announced that they were strengthening rent laws, and would no longer let the people sell on the streets without paying the government rent. Rachel said the policy was never enforced because the government feared a revolt by the people. Africa is a place of extremes, and unfortunately a lot of people are hurt by it. After our conversation this evening with Dean and Rachel, I know that the next three days are going to be full of rich experiences. I finally found a solution to the buzzing fly above my head last night… Blanket fort! While it was hot and a little stuffy, at least nothing was flying around my face and the faint buzzing of insects was muted with the blanket layers over me. Kylie and I quickly pulled our things together and readied ourselves for the journey ahead. We tidied our things and any mess that we caused and waited for Chris. He was very prompt and we soon found ourselves on the road to the bus station. Since we got there early, we chatted with Chris before setting off. Couch surfing has been an incredible experience here in Africa. Not only have we met wonderful people, we’ve had some of the most profound and interesting conversations. I feel like our time in Chris’s home was entirely an educational experience and that I’m leaving smarter and more conscientious of global concerns and solutions. One such example is the usage of biofuels in the UK. Just before exiting Chris’s car he mentioned his dissertation, an analysis/model of reputation for various organizations. It really will make for some fascinating research and I’m curious to hear about its progress. As usual when we arrive early in Africa… We end up waiting. Our bus scheduled for an 8am departure, leaves at 9am today (judging by the speed they’re cleaning/loading the vehicle). At this point I’ve learned a lot of patience and I’m not too fussed about it all. Just as long as the border crossings go smoothly I’ll be just fine! When we finally boarded the bus it was 9:30, a whole 1.5 hours after we were scheduled to depart… Meaning that we’ll likely arrive around 10pm tonight. I’m praying that Rachel will still swing out to get us at that time! As the bus began to roll out from the station, as per usual in Malawi a well dressed minister came aboard. The one thing that was different than other ministers is he gave his address entirely in English, reading from psalms. I’m not sure whether it’s because our bus had a total of 12 people or that Zimbabwe shares English as a common language (instead of chewa), but either way I tuned in. The minister both blessed the bus ride, and cursed demons of accidents in the same prayer and pronounced that nothing would happen. While I don’t share his same religious denomination I listened respectfully as he continued to preach. The tone in his voice and the words he emphasized clearly betrayed the fact that he listens to southern evangelical television (as much of Malawi does), and he roared his sermon even with so few people on board. He concluded his sermon by asking for a donation as he is a full time minister and doesn’t support himself by any other means. Even with such a small number of people he got approximately 500 kwacha from the passengers before disembarking. Initially I was quite worried we would get in very late since we had a delayed departure, but our driver seemed intent on making good time and zipped along the road at record speed. We soon left the dry region of southern Malawi and made it to the border between Mozambique and Malawi. Border crossings have become somewhat of an adrenaline experience for Kylie and I since we’ve now had a couple of incidents. As we approached the border my mind began filtering through various backup plans and options in case things didn’t go as planned. Thankfully the backup plans were entirely unnecessary. As we approached the border our bus driver took one look at the long line of people and told us that if we all pitched in 1000 kwacha (2 dollars) they could get us through faster. With only 1500 to add to the group pot, another passenger made up the difference for me and within moments we had entered Mozambique. The countryside changed drastically from dry, dusty earth to a beautiful scene of green. I’ll be honest, even though we only were passing briefly through Mozambique it felt like the ride slowed down. Probably had something to do with the heat of midday. Both Kylie and I closed our eyes on the bus ride and rested through the heat wave. Before we knew it we were at the exit border for Mozambique and the entry border for Zimbabwe. As Kylie and I entered the office, I could see an American man arguing with the official across from him. I felt bad for the man because I knew exactly what he was going through. When it was my turn to get my visa stamped, the official used my passport to show the man what he was missing, an exit stamp. As I turned to leave the last thing I heard the man say was ‘okay, I know I’m wrong but let’s do what we need to to make this work.’ The cue that a bribe was about to be paid. As we made our way up to the Zimbabwean border we saw another long long line of people. This was going to take some time. Kylie and I decided to pass the time chatting with the border official, our bus driver, and a couple other individuals we met along the way. But before our turn to get visas came, we heard the shrill call of a whistle. Immediately the border became silent and Kylie whispered and asked me what was going on. I’d read about the border being open late so I wasn’t worried about it closing, so I turned and looked for the cause. The Zimbabwean color guard was retiring the flag for the day. It was a serene and impressive site as the border froze in time for those 5 minutes. Cars and buses turned off their engines, people stopped talking, and life paused for a moment. As soon as the flags were retired border life resumed and soon Kylie and I had our passports in had with our visas signed and ready. We re-boarded our bus and began the final leg into Harare, the capital of Zimbabwe. Both Kylie and I exhausted from the journey, fell asleep to bouncing of the bus on the road. I woke up about an hour later as we started approaching the city center of Harare. I immediately noticed a difference. Between the Apple Store, bright lights, and large buildings, I could tell Zimbabwe was much more modern than Malawi. The large lights from some of the houses were bright enough to illuminate the road, and numerous buildings were scattered about. The city just felt more modern, it’s hard to really describe it any other way, things just looked put together. One thing I failed to mention in depth was our friend Helen. On the bus ride to Harare the girl sitting behind Kylie and I struck up conversation with the two of us. She was very friendly and chatted with us all throughout the journey. She even waited for us to make sure we got through each border smoothly, gave us some of her travel snacks (coconut cookies! ), let us use her phone to call Rachel to let her know we were arriving, and a series of other very kind things. It was honestly so touching and provided me with a good lesson in Christlike service. After pulling into the bus depot we met Dean, Rachel’s husband. He was so friendly and kind, and it was fun chatting with him on the way to their home. When we met Rachel we had a glimpse of some of the incredible things she’s doing. I know I’ve mentioned before that handouts an development projects tend to cripple a society as it creates a system of reliance. While that still is true, my eyes were opened in my conversation with Rachel and her husband and I understand the issues better. I believe the issue is truly double sided. While yes, aid when given freely creates a system of reliance, genuine, human compassion dictates that something be done to serve others. Hence why there are the Easterly and Sachs of the world arguing the best way to solve the issues of development. Both are right and both are wrong. It just depends what your end goal is, national self-reliance/stability or saving individual lives. Dean and Rachel’s kindness truly was touching. 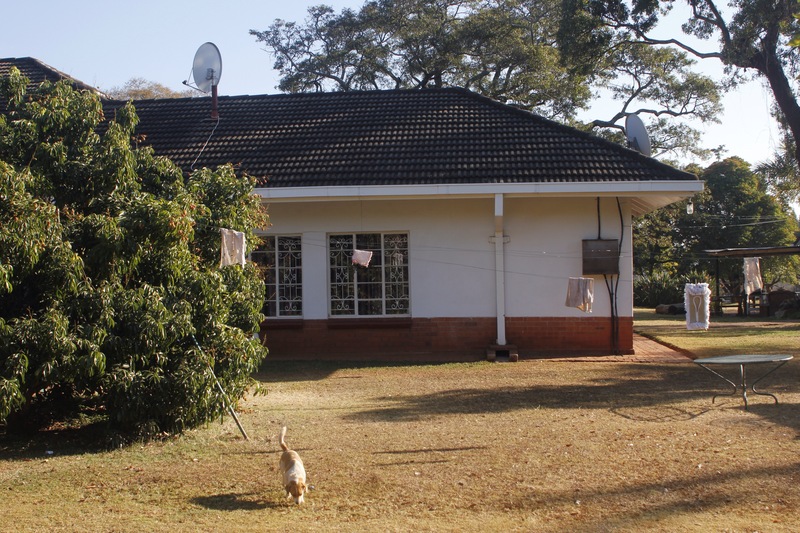 Their home was a beautiful little place situated on north road in Zim. Rachel is an incredible woman and is the founder of eyes for Zimbabwe, a group that goes out into the bush to provide human necessities for the people there. Everything from cataract surgeries, clothes, food, nutrition assessments, you name it her organization provides it. They’re doing some amazing things with some amazing people! When we dropped our things, showered, and climbed into bed – I was so grateful for how smooth the journey was. Heavenly Father truly watched over Kylie and I and I feel so blessed to be here. Plus, the bed is soft and no mosquitoes are buzzing around. Bliss.